Brian Witkin’s dad performed at Woodstock as a member of Sha Na Na. The son had experienced success running a CD store at the all-ages Epicentre music venue. But a major setback ten years ago informed Witkin, then 22, that maybe the music business wasn’t for him. Lemmy Kilmister (feat. Chris Declercq), "We Are the Ones"
Pacific Records, his record label/recording studio complex behind Soma on Sports Arena Boulevard, just passed its five-year mark. Recently, Rolling Stone noted the release of “Lemmy’s Final Solo Recording,” issued by Pacific. 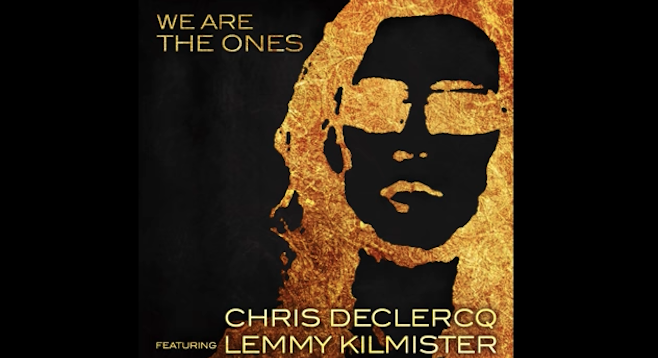 Witkin says they got the Lemmy release because one of his 16 active artists (guitarist/producer Chris Declercq) met the Motörhead frontman at the Rainbow Bar and Grill on Sunset and recorded Lemmy’s “We Are the Ones” last January. Witkin appreciates the publicity the Lemmy release will bring to Pacific Records but says the label’s mission is to break new artists. “Our core business is trying to take artists no one has heard of and break them worldwide." He says his model is different than Surfdog Records', the 24-year-old Encinitas-based label whose 30-plus artist roster includes such established artists as the Stray Cats, Eric Clapton, and Gary Hoey. Music of Pacific singer/guitarist Lindsay Perry is on four different networks’ TV shows; and local pop group Supergroupie has music on episodes of Empire, Scorpion, and Criminal Minds. Five Pacific Records artists appeared on the soundtrack for 9/11, an indie film released in September with Charlie Sheen and Whoopie Goldberg.